It has been said time and time again that 2018 is the year for women. For NAWBO, the quest for equality is at the root of our very existence. For us, this is not just an election cycle where we have purposely supported an equal number of candidates from both parties, underscoring our bipartisan efforts on behalf of women—it is also a year of celebration for women in the business community. October 2018 marks 30 years since the signing of H.R. 5050, the Women’s Business Ownership Act. This year, while supporting the women who come out to tell their powerful stories, our nation should also focus on highlighting how women are constantly advocating for change through a celebration of our accomplishments, as well as a discussion about the future business landscape for women in the United States. Let’s begin where the tide started to turn for women in the business community: 1974. Before 1974, there was no way a woman could even apply for credit, much less get her own credit card, until the Equal Credit Opportunity Act was passed. Before then, credit in her own name was out of a woman’s reach, and the doors to the business community were closed. Women could not join their local chamber of commerce or rotary club. For these reasons, in 1975, a dozen like-minded businesswomen in the DC area gathered to share information and create a professional community to further and strengthen their entrepreneurial interests. This gathering was the birth of NAWBO. A year later, we had set up a national network of chapters serving women nationwide. Ever since, our country has seen the growth and development of female business owners nationwide. 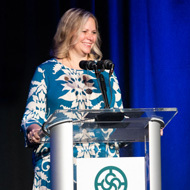 NAWBO began to fill a void for the community of women business owners, and the drive to achieve parity in business remains of the utmost importance for this organization. One of the most notable pieces of legislation that celebrates the advocacy of women is H.R. 5050, the Women’s Business Ownership Act. Thirty years ago, with President Reagan’s signature, women in the United States began to receive the resources necessary for starting a business. Thanks to NAWBO, advocates who worked on the Women’s Business Ownership Act, a woman could finally get a business loan without a male co-signer, and women-owned C corporations now counted as part of the census. With this law, our nation saw the establishment of the National Women’s Business Council and precursors to women business centers. Regardless of these monumental changes 30 years ago, we continue to find need for improvement. Women continue to fall behind in areas that would exponentially increase their revenue streams. Some lack the skills to simply ensure future prosperity for their business. As a government contractor, I am all too aware of the struggle to achieve the goal of 5 percent of all federal contracting dollars being awarded to women-owned small businesses. The goal, set by Congress in 1994, took forever to see implementation, and has only been reached once, in 2015. With a federal budget in the trillions, women deserve to have their piece of the pie, and they should not have to jump through hoops and over hurdles to get there. On another note, according to a 2015 Brookings Institution study, women hold only 18.8 percent of all patents, and a 2016 study from the Information Technology & Innovation Foundation reveals minorities make up to just 8-13 percent of innovators. For this reason, NAWBO is supporting the passage of the SUCCESS Act, which addresses underrepresentation in the patent process and identifies best practices to close the gaps in patent rates for women and other underrepresented groups. If we want women to excel, they first need to be on equal footing with their male counterparts in the procurement and patent processes. Through our national survey this year, NAWBO found that half of our members surveyed have not taken any steps to prevent or prepare for a cyber-security incident, and although many of these women are preparing for retirement through savings, more than half of them have not done any succession planning for their businesses. These aren’t just women-owned businesses, these are job creators and contributors to local economies. Policymakers need to put these issues on the forefront of their agenda for the 116th Congress. As 2018 comes to a close, remember that the year of women lives on, but to ensure that this year is not just a memory, we must advocate for change and push policy across the finish line to truly reap the rewards. To view the complete special edition, click here.